In February, Executive Chef Jeff Jackson’s popular longstanding eatery The Grill at The Lodge at Torrey Pines closed for an extensive overhaul. Now nearing the homestretch of the $2.5 million remodel, upon reopening doors to the public the week of June 13, The Grill will see a reinvigorated patio expansion overlooking the iconic Torrey Pines Golf Course - complete with five outdoor fire pits, an overhead wooden trellis, additional seating and an outdoor lounge - alongside a revamped kitchen, which sets the stage for Chef Jackson’s highly anticipated new menu. Executive Chef Jeff Jackson’s reimagined take on The Grill’s culinary program includes menu classics alongside newly created dishes, which marks the first menu revamp since The Grill’s inception in 2002 with the opening of the AAA Five Diamond Resort, The Lodge at Torrey Pines. Offering a more casual, laid-back atmosphere in comparison to The Lodge’s critically acclaimed, fine-dining counterpart A.R. Valentien, Chef Jackson is bringing a playfulness to the menu with hints of nostalgia as he reminisces about childhood moments and favorite dishes with a mature twist, while incorporating the classic and time-honored techniques for which he is respected. 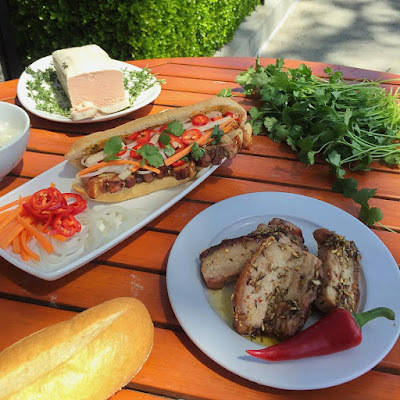 The pride and joy of Chef Jackson’s enhanced culinary program is a custom-built wood-fired grill to be located for all to see on the restaurant’s remodeled outdoor patio. Designed by San Diego-based grill expert, Phil Roxworthy, this four-in-one statement piece stands 6-feet tall surrounded by natural boulders and incorporates a guest facing fireplace opposite a massive six foot grill, two rotisseries and a six foot oven, creating endless options for the culinary team. Alongside Chef de Cuisine Kyle Wiegand, Chef Jackson incorporates a variety of global influences which make up California’s culinary heritage, but it’s his homage to the Santa Maria-style wood burning grill, oven, and rotisserie that will set a distinct tone and serve as the foundation for the menu with an abundance of slow-cooked proteins and farm-fresh ingredients sourced from some of the region’s most notable organic farms. Standout menu items include Chef Jackson’s reinterpretation of the Monte Cristo with wood roasted turkey, applewood ham, and gouda on raisin brioche served with strawberry green pepper jam; a pressed Salmon sandwich with tomato, Bermuda onion, Nicoise olive, lettuce, boiled egg, radish, and red wine vinaigrette on french bread; Vietnamese style Bahn Mi sandwich with porchetta, chicken liver pate, pickled carrots, daikon and jicama, cilantro, and red jalapeno; the five spice quinoa with roasted vegetables is a dish that will carry all veggies prepared on the wood-burning grill; and the 1960’s Hippie Vegetarian sandwich with cucumber, red onion, eggplant, grilled peppers, avocado, tomato and sprouts multi grain bread and Benedictine spread. 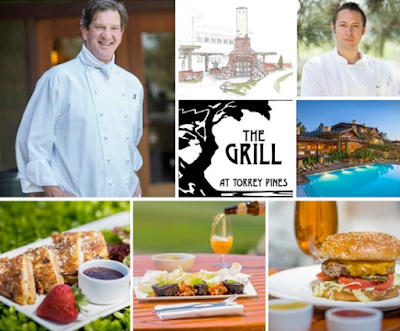 The Grill will serve breakfast, lunch and dinner daily upon opening the week of June 13. The Grill’s famous trademark Drugstore Burger and Ruby Brook Trout Amandine as well as a few other favorites will remain available on the menu, alongside an expanded selection of local craft beer with 12 taps from some of San Diego’s finest craft breweries. To celebrate the re-opening of this quintessential eatery, The Grill at The Lodge at Torrey Pines is hosting "An Evening with Drew Deckman and the Valle de Guadalupe" on Friday, July 15, with an intimate dinner under the stars enjoying the Best of Baja. Esteemed Executive Chef Jeff Jackson has put together a spectacular five-course family-style feast highlighting traditional dishes and ingredients from this unique region, which will be prepared on the outdoor rotisserie. The dinner will feature wine connoisseur and Michelin starred Chef Drew Deckman as well as Hugo D’Acosta, the premier wine guru of Valle De Guadalupe, who will showcase rare wines normally unavailable in California. For those who prefer hops to grapes, Eugenio Wendtlandt of Wendtlandt Brewery, voted Best Mexican Brewery 2015, will also be in attendance in addition to other craft beer selections from the Agua Mala region. Tickets are available for $125 per person. The Lodge at Torrey Pines is located at 11480 North Torrey Pines Road in La Jolla. For more information, call 858.453.4420 or visit lodgetorreypines.com.